Have you bought your copy of the book for Christmas? Many must think it makes for a great stocking stuffer. Can you imagine a married girlfriend giving this book to their unmarried/singled best friend as a holiday gift? Here girl I think you could really use this gift. For some reason, women have latched onto every word of advice Steve Harvey spews. Much like a pimp, he's been able to draw many into his comforting words. In the Essence article we learn he almost had Oprah. She was all set to offer Steve his own TV talk show until she learned of some issues from his past... but one blogger for Loop 21 has a problem with the magazine itself putting Harvey on their cover in the first place. 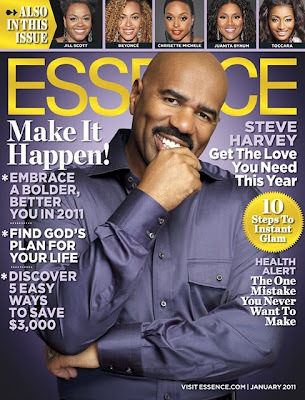 In the blog, "Dear Essence, Why Did You Put Steve Harvey on the Cover?" 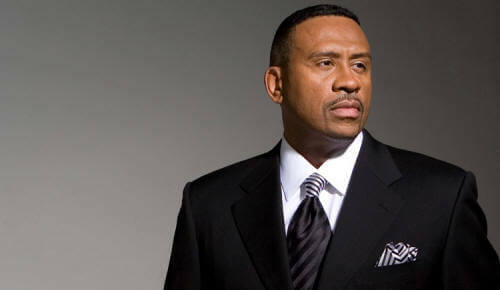 Felicia Pride writes: There I was sitting in my barber’s chair, minding my business, about to get my do cut. I look over to the empty sofa across from me and what do I see? 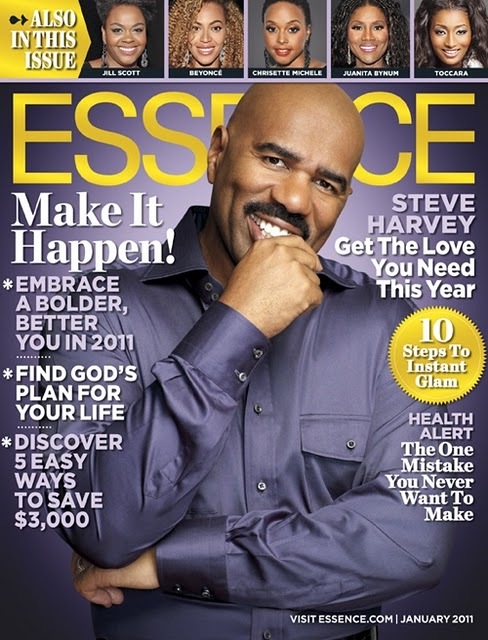 Steve Harvey and his cheesy grin on the cover of Essence. Immediate head tilt. You know the kind of motion that dogs do when they don’t understand something? That was me. This is what I understand: Steve Harvey is a personality with a big ole platform. He stumbled upon a goldmine: black women and singlehood. With the assistance of major media outlets like ABC, he has helped to turn being single into an epidemic that’s threatening the very fabric of black womanhood! A plague so serious that only a comedian turned relationship “expert” could provide the necessary relief. And I get that media—television, radio, books—is a business. Harvey’s new self-help guide dropped this week: 'Straight Talk, No Chaser: How to Find, Keep, and Understand a Man. 'And that man has books to sell. But this is what I don’t understand: WTF is he on the January 2011 cover of Essence? Consider the lack of publications that cater to women of color. Consider how often black women grace the covers of “mainstream” magazines. Then you realize how precious and valuable Essence’s cover real estate truly is.